Heat rash (Pictures): Heat rash is an irritation of the skin that results from excessive sweating during hot and humid weather. Heat rash appears as clusters of red papules or blisters on the skin. It is more likely to occur on the neck and upper chest, in the groin, under the breasts, and in elbow creases. Children are more likely than adults to develop heat rash. 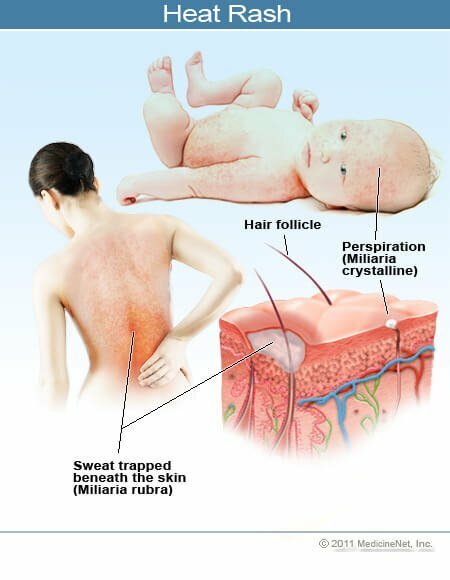 Heat rash is not a serious condition and can be easily treated by keeping the affected area cool and dry.